Chelsea cruised to victory over League One side Nottingham Forest to book their place in the FA Cup fifth round. The Blues opened the scoring when Andriy Shevchenko's close-range volley deflected off Forest's John Curtis. Didier Drogba added another goal with a curling 25-yard free-kick and Mikel Jon Obi then poked the ball home just before half-time. Forest's best chance came courtesy of Junior Agogo, who fired his shot across goal from 12 yards out. Some say the FA Cup is a leveller but that was not the case at Stamford Bridge. Forest, who are third in League One, never got going and failed to put the Blues under much pressure. Before they could find their feet, the visitors found themselves a goal down when Shevchenko followed up his midweek brace against Wycombe to fire in from five yards, thanks to a massive deflection off Curtis. Chelsea, who rarely stepped up into third gear, went two up when the influential Drogba curled in his 22nd goal of the season from a 25-yard free-kick. Unlike League Two outfit Wycombe, who lost to Chelsea in a Carling Cup semi-final, Forest did not compensate for their individual inferiority with much-needed collective bite. Consequently Lassana Diarra was allowed to control matters in the middle, which enabled Frank Lampard, Shaun Wright-Phillips and Obi to roam. And roam they did. Wright-Phillips saw his snatched shot inside the area go fractionally wide, while Lampard had two efforts from the edge of the box blocked by the Forest defence. However, the third member of the trio, Obi, did get some reward when he poked in the third goal after Lampard's corner deflected off Forest defender Julian Bennett and keeper Smith. Whatever gameplan Forest boss Colin Calderwood conjured up before the match had to be changed at the break. The Scot introduced Sammy Clingan for Grant Holt and the tweak seemed to have some positive effect, with the famous Nottingham side enjoying a good spell at the start of the half. Their best chance of the game came when Agogo eluded his marker at the edge of the area to fire his shot across the face of the Chelsea goal. But after that bright moment, Chelsea came out of their brief slumber. Lampard had a shot saved by Smith's leg, Shevchenko rifled two shots wide from inside the area, while Michael Essien had his powerful header saved on the line by Curtis. By this time the contest was over, allowing Chelsea boss Jose Mourinho the luxury of giving 16-year-old substitute Michael Woods a late run-out in the famous Chelsea colours. "We killed off the game in the first half and by the second half the game was over. "I brought on the kids towards the end because of our good position." "It was a dream tie and we played in a dream - we were ineffective. "We didn't show any of our ability in the first half. "If you get through the opening period that's OK, but to come here and play below par wasn't good." Chelsea: Cech, Geremi, Essien, Carvalho, Bridge, Wright-Phillips (Morais 81), Diarra, Lampard (Woods 78), Mikel, Drogba (Kalou 61), Shevchenko. Subs Not Used: Cudicini, Ashley Cole. 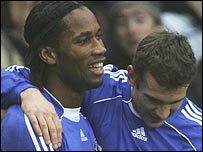 Goals: Shevchenko 9, Drogba 18, Mikel 45. Nottm Forest: Smith, Curtis, Breckin, Morgan, Bennett, Southall, Gary Holt, Perch (Dobie 72), Grant Holt (Clingan 46), Tyson, Agogo (Lester 72). Subs Not Used: Redmond, McGugan.